"Special people have special problems." 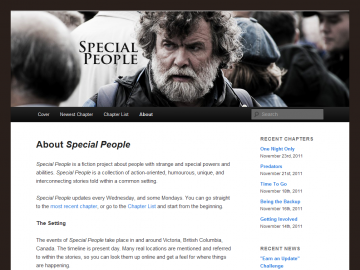 Special People is a fiction project about people with special powers and abilities. These stories are action-oriented, humourous, and unique. The events of Special People take place in and around Victoria, British Columbia, Canada. The timeline is present day. Many real locations will be mentioned and referred to within the stories, so you can look them up online and get a feel for where things are happening. Characters will overlap between stories, and even interact with one another, but unlike a traditional novel, they may not not all tie together into a single climax and resolution. Some characters will be one-offs, their stories told in single installments, while others will have longer story arcs, spanning multiple chapters or episodes. I found Special People almost by accident, and I am glad that I did. There certainly has been a lack of good 'super powered' fiction in the past years. I like the idea of normal people going about their daily business, but with special abilities.